Quite surprisingly it isn’t addressed to anyone in the Lovett family at all but rather to Rice President Kenneth Pitzer’s son Russell and daughter-in-law Martha. This is, of course, instantly engaging. I began to think through by what improbable route this had traveled to me but couldn’t quite get it to make sense. In the end I had to write to Russell Pitzer, who graciously helped put the pieces together. 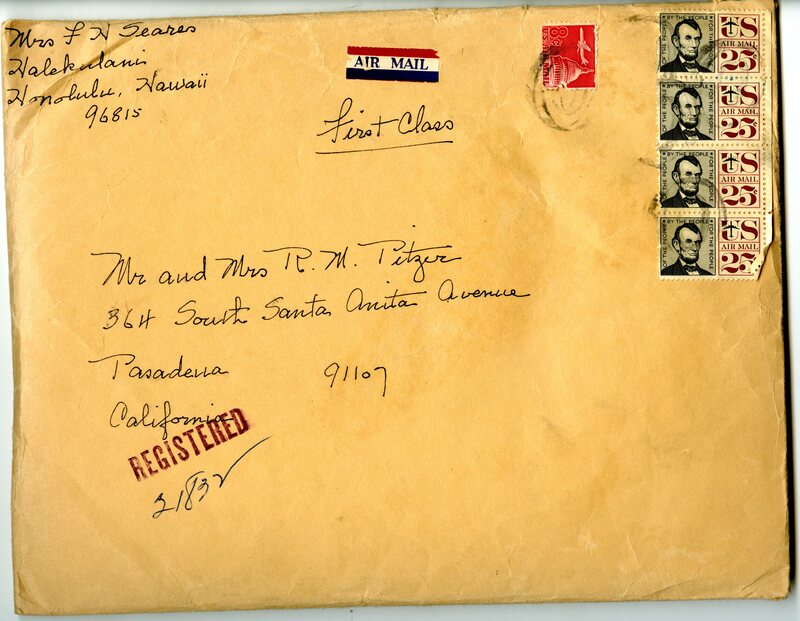 What I didn’t know was that Mrs. Seares, who sent the package, was Martha Pitzer’s grandmother. 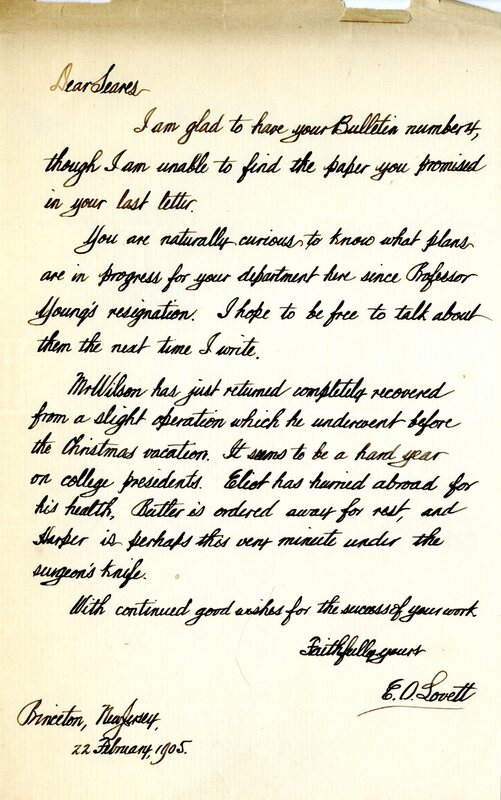 After Frederick Seares passed away in Hawaii in 1964, she must have found these letters among his things and, knowing that her granddaughter’s father-in-law was then president of Rice, sent them on to her. At some point Russell had to have passed them on to his father, who then would have handed them to Malcolm Lovett, Sr., then a member of Rice’s Board of Trustees, who kept them for his son to find and give to me. And in the end all is as it should be. Bonus: This is my second favorite letter of the bunch. If anyone ever offers you a college presidency, I recommend turning it down. This stuff is fascinating………and the story of how they got to Rice would make a movie!! Thanks………..
“Mr. Wilson” is, of course, Woodrow Wilson, who was Princeton’s president from 1902-1910. Eliot is Charles William Eliot, president of Harvard from 1869 (at age 35) to 1909. He is the youngest and longest-tenured president in Harvard’s history. As described on his Wikipedia page, Eliot opposed all college sports, excepting the “clean” ones of rowing and tennis, and “initiated repeated attempts to acquire his former employer, the fledgling Massachusetts Institute of Technology.” T.S. Eliot was a cousin. Butler is Nicholas Murray Butler, president of Columbia from 1901-45, the longest tenure in its history. Seems a little strange, but maybe that was the custom of the time.